Bharat Electronics Limited (BEL) Published Recruitment Notification for Contract Engineer (Electronics), Contract Engineer (Mechanical - Product Design), Contract Engineer (Mechanical - Material Management), Contract Engineer (Computer Science), Contract Engineer (Optics) and Contract Engineer (Laser) Posts. View More Details About This Recruitment Including Total Posts, Posts Name, Qualification, Age Limit, Salary, How to Apply etc., are Given Below. 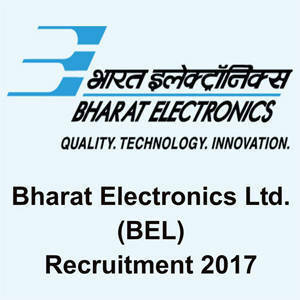 Contract Engineer (Electronics) : First Class for General and OBC Candidates and Pass Class for SC / ST Candidates in B.E. / B.Tech (Electronics / Electronics & Communication / Electronics & Telecommunication / Telecommunication / Communication) from a AICTE Approved Institution / University. Contract Engineer (Mechanical - Product Design) : First Class for General and OBC Candidates and Pass Class for SC / ST Candidates in B.E. / B.Tech (Mechanical) from a AICTE Approved Institution / University. Contract Engineer (Mechanical - Material Management) : First Class for General and OBC Candidates and Pass Class for SC / ST Candidates in B.E. / B.Tech (Mechanical) from a AICTE Approved Institution / University. Contract Engineer (Computer Science) : First Class for General and OBC Candidates and Pass Class for SC / ST Candidates in B.E. / B.Tech (Computer Science, Information Technology) from AICTE Approved Institution / University. Contract Engineer (Optics) : First Class for General and OBC Candidates and Pass Class for SC / ST Candidates in M.Sc. (Optics) / M.Tech (Tech-Photonics / Applied Optics / Optical Engineering / Photonics) from any AICTE Approved Institution / University. Contract Engineer (Laser) : First Class for General and OBC Candidates and Pass Class for SC / ST Candidates in M.Sc. (Optics) / M.Tech (Tech-Photonics / Applied Optics / Optical Engineering / Photonics / Lasers) from any AICTE Approved Institution / University.